Wooden lockers are an elegant yet sturdy and long-lasting solution to any storage problem. Both useful and attractive, they’re great for storing and protecting all kinds of items, including clothing, outerwear, shoes, personal accessories, equipment, and valuables. They’ll add a touch of style to any home, school, or business while also providing practical security and organization for a wide array of the stuff for life. Wooden lockers are an excellent solution for any type of space, whether your home needs a lot of extra storage, or your workplace needs a spot for valuable items and employees’ personal possessions. Schools, businesses, hospitals, offices, gyms, residences, or any other place that would benefit from a safe area to keep valuables would profit from the addition of a set of wooden lockers. General Timber Lockers come in two sizes and are an attractive storage solution, with 6 wood finishes to choose from – beech, light oak, birch, maple, ash, and cherry. 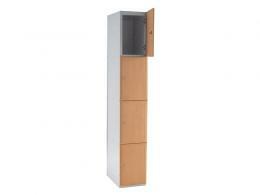 Internal fittings include fixed shelves, fixed hooks, and garment hanging rails. Concealed self-closing hinges and profiled doors make these wooden lockers an elegant storage option. Laminate Door Lockers are made with a steel frame and solid grade laminate doors, combining the value of sturdy design with modern appeal. There are two options for door placement: choose inset doors that contrast with the outer frame, or plant-on doors that cover the entire front locker face. Either option is visually appealing and offers practicality as well as style. 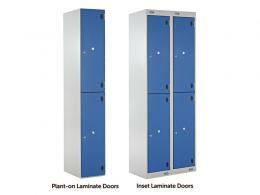 Both General Timber Lockers and Laminate Door Lockers come with a one year warranty including parts and labour. Free delivery is also available within 8-10 days for Laminate Door Lockers and 27-30 days for General Timber Lockers.